My opinion on the shows hasn't changed since I wrote about them in June. I still think the presenters have an admirable ability to talk about nothing. It's like watching QVC except that instead of selling diamonique jewellery they hawk empty hopes and dreams. Which is worse. Obviously. Anyway... somehow, the knowledge that not only were ITV and five both broadcasting examples of the genre in the early hours of the morning but that they were actually broadcasting near enough the same game at the same time made the whole thing seem worse. They're both asking you to think of words or phrases that follow the word Hot. Yes, one is hosted by a pretty but not sexually threatening blonde and has a wordsearch and the other is hosted by a hunky blonde who can't work out whether he admires Alan Partridge more or less than he does Steve Coogan but the essence of both games is the same: HOT-BLANK. I don't know why this makes the whole thing seem worse. Surely when things are as rotten to the core and morally bankrupt as this nothing else matters? Maybe the two near-identical games just underline the paucity of imagination at work? Or maybe it feels like they're ganging up on people and working as a team. I don't know. In any case, I think it's pretty strong evidence that we are all going to hell in a handcart. ... and you can bet your bottom dolar that Hot Legs, Hot Cake, Hot House, Hot Potato, Hot Line, Hot Foot and possibly Hot Fuzz were not the answers they were looking for. Hot Pants is shown as it s a 'worked example'. These programmes are so odd. You start off thinking it's an overlay but then when they walk backwards you realise they really are in a proper studio, all by themselves, in front of a massive screen. There's something really lonely about it and the fact they're in a real studio doesn't help. Pretty sure that blond guy is the one who sometimes gets a bit too lonely and starts doing an impression of Frank Spencer. It's actually not bad. I recently met someone who has presented some of these programmes in the past - and got on very well with them. I genuinely think it takes great talent to do the job well... which obviously doesn't make it any better. There's a guy on five - Chris Hopkins, I believe - who is the best of the bunch. He's brilliant at persuading people that now is the best time to call. Having had to get up early to work this morning I was watching a 'drama' (cops solving crimes in ways that real cops don't) show on Channel Five last night. In the advertising breaks they were trailing one of these 'quiz' shows. The presenter must be in the top ten most irritating people on television! They already did this "hot ___ " idea a few months ago, which just show's they're repeating each idea on a loop. I'd reached a similar conclusion, until I was recently in Switzerland and doing a bit of channel-hopping. I stumbled on a cable channel that had managed to make it even worse. As far as I could tell from the couple of seconds I could bear to watch, it was the same premise as over here, but it was being presented by ladies in their knickers being a bit suggestive. Lovely. The one on the right is 'hot line' surely, am I too late to call? I'll have to look out for this quiz to roll around again, not long to wait by the sounds of it. There are several right answers available... but the wordsearch will also contain lots of wrong answers... by which I mean, they are words that pair up with 'hot'... but are not the "pre-selected winning answers." They charge 75p for every call whether you get through to the studio or not. They get 100s of calls a minute and often go for long periods without anyone getting through. I have no idea what the chances of getting through are, but it's a variable they can alter because they have "speed rounds" - where they take more calls than normal. Presumably they also have times where they encourage callers and the chances of anyone getting through are so slim that they're neglible. They seem to have cleaned their acts up a bit in that the answers are generally more reasonable than they used to be. There are lots of clips on youtube showing some completely unguessable answers from previous shows. I don't think these happen anymore... one of the companies was fined after one of the pre-selected answers to "Things you might find in a woman's handbag?" turned out to be "rawl plugs." You know... the traditional Christmas greeting, "Have a cheeky Christmas" that you hear so often. I personally hate these 'programmes'. I think that as a deterrent the hosts should be hung up by the ankles and beaten with sticks. Maybe just before the lottery numbers are drawn on saturday nights. I would tune in for that. Have you seen the foreign clip of the quiz show presenter being sick live on air yet? I thought it was a bit weird that she was telling a few thousand viewers about her menstrural habits rather than just lie and say she had a hangover, but my friend used to live in the same place she was from (Sweden? I forget) and said that they're all pretty open over there, they have one set of public toilets for both sexes and things like that. Rum papum Rum papum Ooh Ah Ooooh"
I don't think you'll ever hear a more Christmasy sentiment. I can't claim to have seen this tripe, but why is it worse than Blankety Blank? Obviously the presenters lack the charm of the lovely Terry Wogan, but what else? Well for a start these things are worse than Blankety Blank because Blankety Blank was brilliant. Yes there are the Terry Wogan years but let's not forget Les Dawson at his finest too. But more important than that, regardless of whether you like or dislike Blankety Blank it is just a slice of light entertainment, frippery and nonsense, no more, no less. These things however are immoral. 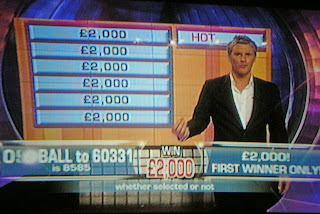 The presenters job is to persuade people to make phone calls in the hope of winning a prize. People make a call, hear a recorded message saying that they haven't got through but might want to try again and get charged 75p for the privilege. They can change the likelihood of a caller getting through to the studio as they see fit. They can allow more calls when they want to... and that means that they can also stem the tide when they want to. Watch it one time. The prize will be £200... maybe even a grand. They might have ten incorrect answers before they get a right one. The same puzzle, with ten random answers will stay live for 90 minutes or two hours before it is solved... not because people are stupid but because there are 500 possible answers... but only 10 that they have preselected as winning answers. During those two hours, they will receive between 300 and 700 calls per minute. £225 - £525 a minute. They're making £20,000 to £30,000 an hour and people who can ill afford it are being encouraged to spend money they can ill afford to have the chance of winning a prize. No... he's on one of the ITV ones. Make Your Play. I think the band reformed especially for Eurovision - one of the girls was singing in the chorus of Les Miserables, I think - and then, having failed to set Europe alight they went back to whatever it was they were doing. The thing about these shows that's so offensive is that entering is a gamble but there is no way of knowing how bad your odds are. If you enter a normal phone in competition, you understand that if 10,000 people enter you have a 1 in 10,000 chance of winning. People understand that if they choose the right six numbers on the National Lottery they will win a lot of money. But when you call the studio on one of these shows nobody tells you what the chances are of getting through... and sometimes thousands of people call and nobody gets through. It's like walking into your local newsagents, giving them a pound and asking for a lottery ticket only to be told, "I'm sorry, you've given me the wrong pound so I can't give you a ticket... would you like to have another go?" My God - that's a terrible liberty. At least with the lottery there's a shred of hope! I share a hatred of these shows. They're the TV equivalent of people standing outside a bingo hall and mugging old ladies as they come out. That YouTube clip is a classic - "somebody said Mulan, but not Mulan 2..."
I never thought I'd ever see something even more objectionable than a programme that gives screen time to shameless media whores sleeping at 3am, but it's happened. These "shows" are evil. They are a complete ripoff, and the TV companies KNOW it. They make a show spinning picking 21 red boxes at random out of all proportion into a 45-minute show where each box carries some spectacular significance (and you should see the Nintendo DS version!) look like Emmy material. On five, I watch the MLB, NHL, NBA and/or NFL when they're on, three to four nights a week - at least I know I can at least get some kip in Thursday to Saturday, because the turgid pile of toss known as Quiz Call is on. I remember the Panorama about these "interactive game shows" that showed a wordsearch containing types of fish, and the big money answer was 'TUNA' - there was not a single letter U on the board. Another asked you to do a mathematical problem mixing words and numbers, like "35 + sixteen x 4 - fifty-three". The answer was something that bore no relation to the values on the screen - a university professor tried to figure them out, and couldn't. And then there's the ones where you've got four words going across with one letter missing each, and you have to guess the word going downwards. You know how these work, of course, don't you. There are so many possible answers, they can have all calls being for 'wrong' answers, cross them off one by one, and pull the game with just one possible answer left - there's your "correct" one. These "programmes" are offensive, lazy filler for networks that regret going 24 hours a day, and miss the Closedown days. Late night "quizzes" are an insult to those with even a small semblance of intelligence. Thank God ITV Play is being pulled at the end of 2007 - they should ALL be scrapped. It's good when they repeat the same questions that they've done before because you can then look up the answers from the last time round on the Phonequiz Answers website. Then your chances are more about getting through (1 in 200 ish) and less about worrying if you have the right answer or not.